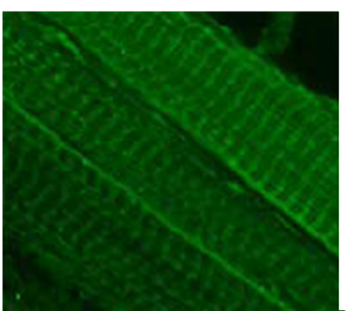 We use transfection to introduce proteins into muscle cells in culture or in living mice. Typically, we “tag” these proteins with a fluorescent protein partner, like GFP, or with a small peptide, like the FLAG or myc epitope, to be able to track its expression and location and to identify some of the proteins in the muscle cells or tissue with which it interactions, by co-immunoprecipitation. For muscle cells that are growing and maturing in tissue culture, the simplest approach is to incubate them with mixtures comprise of lipofectamine and the cDNA encoding the protein or fusion protein of interest. The myoblasts (muscle precursor cells) typically take up the cDNA and, if the promoter is active in the muscle environment, express the protein. Some promoters, like the CMV promoter, are constitutively active; others, like the desmin or skeletal α-actin promoters are only active during muscle differentiation. Introduction of cDNAs under the control of the latter promoters can drive expression throughout differentiation (desmin) or once myogenesis has begun and the myoblasts have started to fuse to form myotubes (α-actin). An example of a myotubes transfected with cDNA encoding mu-crystallin under the control of the α-actin promoter is shown in the molecular biology of muscular dystrophies section.. Unfortunately, no one has yet found a method for getting mature skeletal muscle fibers to develop in tissue culture, so the most mature form of muscle cells one can study in culture are myotubes in which striations are just beginning to form (see the mCherry panel of the mu-crystallin figure, for examples of myotubes). The SR and transverse tubules do not develop normally in these cells. As we are studying proteins that target to these membrane compartments, we need to be able to introduce cDNAs into mature myofibers. For cells in vitro, we do this with viral vectors; for muscle in vivo, we use electroporation. Viral transduction requires that cDNA encoding the protein of interest be placed in a viral vector (adenovirus or lentivirus are typically used) capable of expression. In electroporation, the cDNA is injected into the interstitial fluid of a muscle, and then the muscle is exposed quickly to a high voltage pulse, which introduces small holes in the cell membrane. Below is an example of several muscle fibers transfected by electroporation to express the RhoGEF domain of obscurin as a chimera with green fluorescent protein (GFP. The RhoGEF domain concentrates near the middle of each contractile unit, or sarcomere.